Imagine someone like Roger Ailes or Phil Griffin getting on the phone and calling into a show on their respective networks to scold an anchor and yank her off the air. Even for America’s cutthroat media environment, that would seem a little far-fetched. But that scenario was a reality in Egypt this week. Faraeen TV anchorwoman Rana al-Duwaik was hosting her broadcast of Live from Egypt when the station’s owner called into the show, interrupted her interview, lectured her, and then cut the program short. Duwaik had been interviewing a specialist on the Egyptian government’s recent banning of the April 6 movement, a youth-based group that focuses largely on democracy and free speech and is credited with helping remove Hosni Mubarak from office three years ago. But then the channel’s owner, Tawfiq Okasha, interrupted via phone. “I want to ask you a question, why are you still talking to him?” Okasha asked his anchor, according to Al Arabiya News translations. “He just started talking,” Duwaik defended herself. 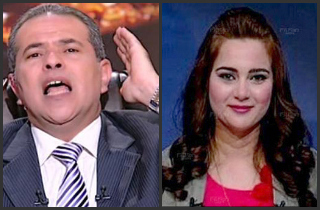 Okasha continued scolding the anchor, before telling her to “Go learn.” Seemingly befuddled, Duwaik complied, saying goodbye to viewers and ending her broadcast. For context: Okasha has reportedly long been a critic of liberal democratic movements in Egypt.